When running Facebook Ads, the first thing you're prompted to do is determine what type of campaign you want to run… once that work is done, it's time to start identifying your audiences. 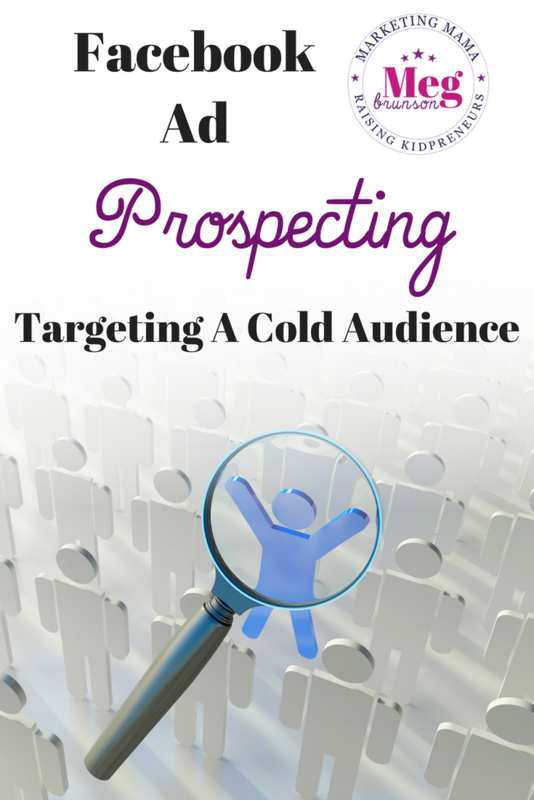 There are two ways to approach targeting, you could target people who are already familiar with you (a warm audience) or proceed with Facebook Ad prospecting to a cold audience. All successful marketers incorporate some level of prospecting, because it's important to always be refilling our funnels with new prospects. So whether you are brand new and HAVE to be prospecting because you don't have any retargetable assets – or if you are a seasoned advertiser just looking for some ideas to enhance your prospecting – this is for you! This article will focus on the Audience section of the Ad Set, and we'll walk through the best practices of building a strong prospecting audience! Custom Audiences will be saved for another day – so, we are going to start with targeting Locations. First, you'll notice that the gray box is a drop-down and it gives you some options for how to target locations. You can target everyone in a specific location (the default – people who either live OR were in the area recently, only people who LIVE in that location, people who recently were in that location, or people traveling in that location (they were most recently in that area, but they live over 125 miles away). You'll have to think about which targeting option makes the most sense for your marketing goals. Then, you can identify the locations that you want to target. You can include cities, states, countries, zip codes, addresses, congressional districts, or even “worldwide” if you want to target everyone regardless of location. Note: It's important to understand how the Facebook optimization process works. Facebook will optimize based on location. 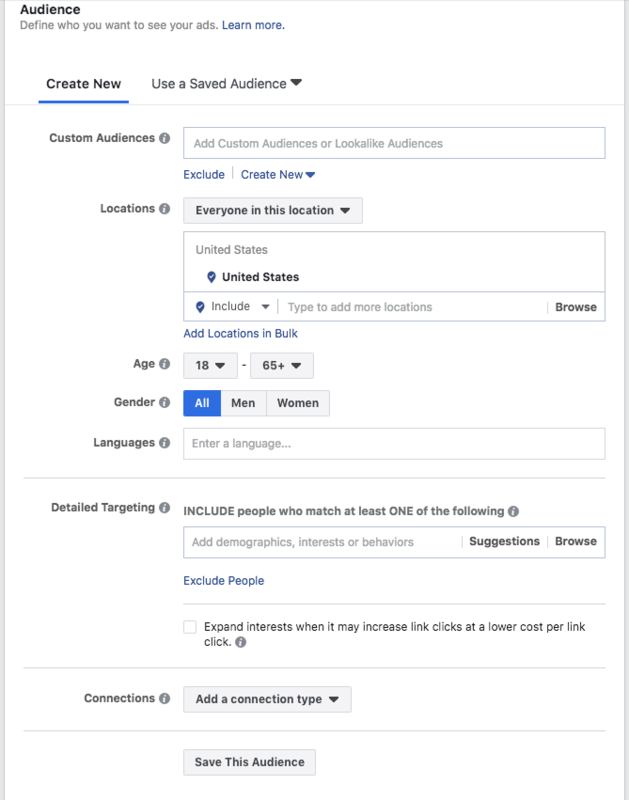 So, if you are running a traffic ad targeting 2 countries – for example the US and Canada – and Canada is getting cheaper clicks, then Facebook will auto-optimize and serve that Ad Set primarily in Canada. This means that at the end of your campaign, you may notice that the vast majority of impressions occur in one region over the other(s). If you want to ensure equal distribution of your budget between multiple locations, then you should set up 2 separate Ad Sets to allow separate and dedicated budgets to each of the regions. Once you've identified your locations, you can select the age and gender targeting options. This is pretty straight forward – how old are your prospective clients and what gender are they? Note: If your product, image, copy, or landing page has anything to do with alcohol, then you will need to target age in compliance with the age requirements in the country(ies) you are targeting. Facebook is strict about this! When it comes to targeting languages, you only need to indicate the languages you want to target IF you are targeting an unofficial language in the country you're targeting. So, when you're targeting the US, you do not have to identify that you are targeting the English language, but if your ad is in Spanish, then you would indicate Spanish if you're targeting the US. If you are running your ad to a worldwide audience, you do need to identify English, because you're ad will be served throughout a variety of countries with different languages. Now, my FAVORITE part. The detailed targeting. This is where things really get fun and interesting! 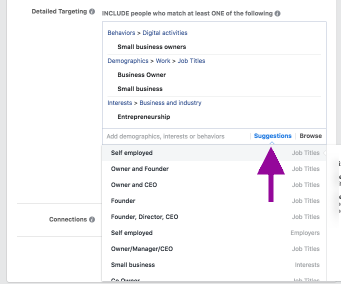 If you've never done it before, or even if you haven't done it in a while – I always recommend clicking on browse and clicking through all of the available targeting demographics, interests, and behaviors. If you have questions about what each segment includes, or where the data comes from, you can simply hover over the segment in question and you'll see a description box pop up identifying the audience segment's size plus a description! It's important to note that some of the segments, like income shown above are only estimates, so there definitely may be a margin of error. Contrary to popular belief, you can not target another Page's fans. That being said, there are some audience segments that appear to be the same as other existing Pages on Facebook – these are targetable interests, and they actually track engagement with the brand/topic – but not specifically Page fans. You can target a combination of interests, behaviors, and demographics as you browse this area! 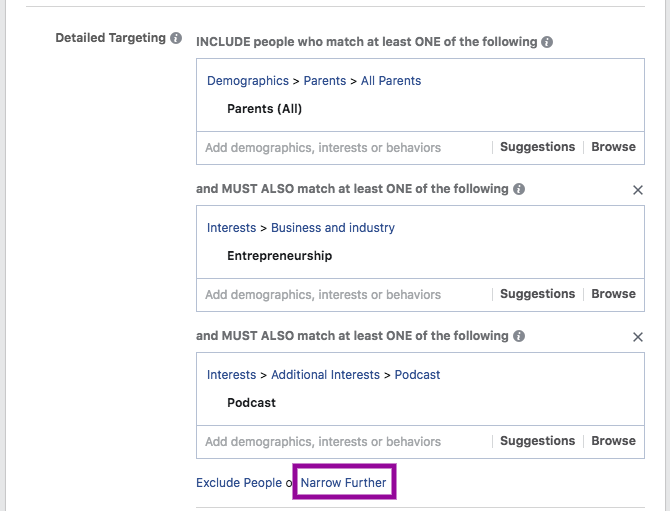 You'll notice a checkbox underneath the detailed targeting section – asking if you'd like to allow Facebook to expand your interests when it may result in higher clicks and lower cost per click… this is totally up to you, but I don't like this option. What it means is that you're only making suggestions in the targeting boxes above. If you check this box, Facebook does not have to stick to your targeting segments, which means if you find something that works really well, it's essentially unable to be duplicated. Facebook will not break down the interests of your audience after the Ad has run – so the only way to get a detailed understanding of what segments work best for you is to test them yourself – without this expansion option activated. Finally, you see the opportunity to target connections, this is a form of remarketing, which we'll cover in a later blog post! But before you move on, consider saving the audience – this will allow you to easily use it again, or make adjustments to it if you want to simply tweak the audience for a future campaign.